Is Tom Brady & Gisele Bundchen in the market for a New Home? Tom Brady and wife Gisele Bundchen not only have very successful carriers, two cute little kiddos, and a massive 22,000 sq-ft home for those kids to run around in; but it’s now rumored the couple may add another home to their already lucrative real estate portfolio. 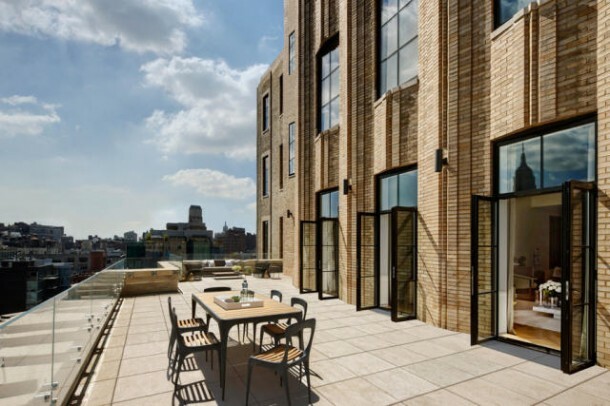 According to our friends over at Trulia, Tom & Gisele may possibly purchase a New York City duplex for $11.495M. Apparently, while Brady was in Boston with the Patriots for some team activities, Bundchen was recently seen touring the 2,800 sq-ft, 3 bedroom condo located in the luxurious, and new, Walker Tower. The duplex condo also includes 4 bathrooms, a very large entrance gallery that opens up and flows into the living and dining room areas, an eat in kitchen, a huge master suite, 2 additional bedrooms both with en-suite bathrooms, and a 400 sq-ft terrace that better shows off the expansive New York views and Empire State Building. The Walker Tower amenities package includes a 24-hour doorman, concierge, library lounge with pantry and bar, refrigerated storage for deliveries, children’s playroom, bike storage room, fitness center with yoga room, sauna and landscaped common roof deck with dining area, sun lawn, observation area and covered cabana room. So what spurred the decision to look for a new home somewhere between $9-12M? Maybe it had to do with Brady’s new 3 year contract extension with the Patriots. On 2/25/13 Brady agreed to a new contract extension that will keep him with the Patriots through 2017, and in doing so, Brady will make an additional $27M in new money over the 2015 – 2017 seasons. Photos and content courtesy of Trulia.com.